inn Essex. 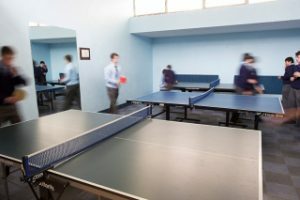 Table tennis may be played every day at lunchtime or after lessons. The table tennis club meets every Tuesday and it is essential to enroll in the club from the start of the season in order to take part in the Leinster leagues or cups. Keep up-to-date with all table tennis news which is posted on the noticeboard in the table tennis area in the sports hall. Five players enjoyed this quite demanding event, plenty of exciting games and some tough opponents. David Daly and Finn O’Neill came third and fourth respectively in Division 1, with Max Carroll finishing second in Division 2 and Ben Foley taking third place in Division 3. Pedro Moreno faced a particularly tough group and was knocked out in a countback. The world of sport can be a hard place! Again, all benefited from the experience of so many games against such a varied group of opponents. Well done to Finn on his first selection! Fixtures are currently being organised and will be posted on the TT noticeboard.